Lowest Price Online: $307.42 ? The Canon Pixma PRO-100 may be at the low end of near-dedicated photo printers geared to photo enthusiasts, but it still produces photos worthy of hanging in a gallery. Some color issues, mostly in graphics. On the latter (sharpness) issue, in case that sounds like a major concern: Dye-based printers have traditionally performed better when paired with resin-coated papers, and that severely restricted the number of photo papers that you could use with them. The PIXMA Pro-100 can handle paper sizes up to 13 by 19 inches, which is very impressive, and its print quality is among the best you're going to find on the market in this price point. Any doubts that the Canon Pixma Pro-100 is a heavyweight piece of kit will be dispelled the moment you (attempt to) take this A3+ printer out of the box. It's astonishingly hefty – so much so that the first thing we did was lift the lid to see where Canon had hidden the bricks. With the Pro-100, Canon has expanded its Pro printer lineup by cross-breeding the Pro-1 and the Pro9000 Mark II. From the Pro-1 we get the improved media handling and CD/DVD printing as well as a three-ink black and white printing option, although not the same inks. (As you can imagine, the more inks, or colors, present, the wider the range of possible mixtures.) As to the Pro-100’s physical stature, it measures 8.5 inches high, 27.2 inches across, and 15.2 inches from front to back. Announced in February 2015, the PIXMA Pro-100S is a minor update to the original PIXMA Pro-100 printer we reviewed in February 2013. Essentially identical to its predecessor, the latest model adds improvements to WiFi, Cloud and Ethernet connectivity. Canon's PIXMA PRO-100S is an update to the PIXMA PRO-100 we reviewed in 2013. Once we got our hands on the new model, however, it became clear that the changes extend only to compatibility with Canon's PIXMA Cloud Link service. I turn it on, I load paper, check my settings, hit 'print' and I'm done. Perfect match to my factory-calibrated macbook pro. Let me reiterate: PERFECT match. No test prints. None. Easy as pie. I've used it regularly for several months now, not even a hint of a clog. After years, no.. I have two Canon Pro9000 Mark11 printer for my museum & have over 16,000 pictures on display & have always used Canon genuine ink. The price of Canon ink has sky rocket. Lately I have been buying some Canon genuine ink.on e-bay but that's even getting more difficult. I have used this printer for the past 3 years. Its an awesome printer. I have every level of canon printer photo paper for this printer. Pro Platinum is my favorite. Ive gone through 5 sets of ink cartridge. Never had a misprint or paper jam. I use this printer to make prints from my 5diii and 5div. LOVE the quality that this printer gives. The price is reasonable! It is super quiet and pretty fast! I use it in my classroom. Absolutely in love with the printer!!! Prints absolutely stunning pictures. Couldn't have asked for more for pictures up to 13x19". - Ink is $124 for all 8 cartridges. For small 4x6 prints, it is actually cheaper to go to Walgreens, but the quality of this printer is higher than the quality of their printers. For large prints, this costs about half what Walgreens charges. This printer has been a very heavy weight door stop basically. I purchased it 2 or 3 years ago, but waited over a month to set it up, so when I couldn't get it to work, it was too late (and too heavy) to return. 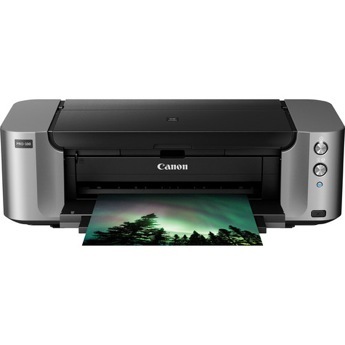 I previously had a large Canon printer that was wonderful. What a great machine!!! Setup is easy for USB and Wireless (I suggest Wireless if your PC(s) move). Supplied USB cable is only 3 feet. This printer prints beautiful plain paper prints. I haven't tried glossy/mat/parchment/canvas paper yet, but after Irma passes by I will and report more. Have only had it a couple of weeks but so far my prints have looked great. Only surprise was probably my own fault for not paying close enough attention to the specs. This printer is a monster. I had to add a side table to my desk. But it is solid and vibration free. This is a steal, works great.